Everyone is talking about the incredible price move in silver on April 18, 2018. For years we have been talking about the setup in the metals markets and alerting our members to opportunities as they arise. Recently, we alerted our members to an incredible opportunity in Silver and we caught this move before it skyrocketed higher. Now, everyone wants to know what’s next. Here is our take on the Silver trade and what you need to know. Technically, Silver has entered a new phase of trend on April 11, 2018 with a new price high that broke previous high price levels. 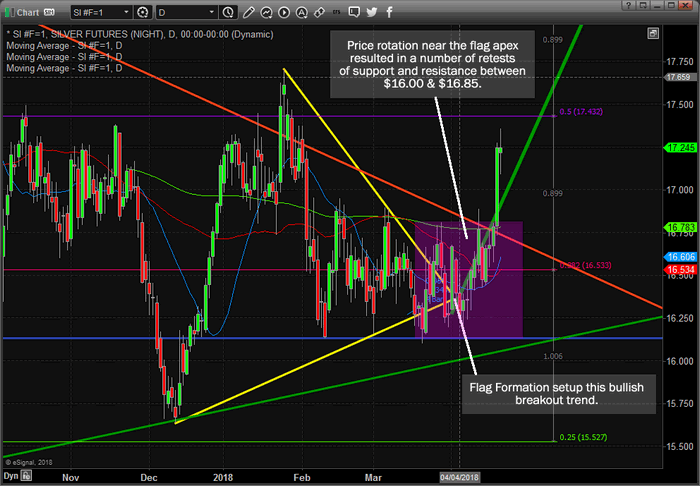 This indicated that Silver may attempt a price breakout with a new bullish trend. Additionally, a convoluted FLAG formation completed near that same date and price began to oscillate between $16.00 & $16.65 – retesting support and resistance levels before the breakout new high on April 11. Our longer-term analysis, which we’ll illustrate in the last chart of this series, was clearly showing us this recent price rotation was the setup of a Wave 3 price advance and we just needed to be prepared for it. This, more detailed technical chart below, illustrates the April 11 new price high breakout as well as the rotation of the primary technical indicators near this April 11th date. Even though we didn’t have any clear closing price advance above technical resistance (near $16.80), we began to see upside pressure building that convinced us the time for the breakout was nearing. This, final, Weekly Silver chart below shows a clearer picture of what we are expecting to play out over the next few weeks and months. 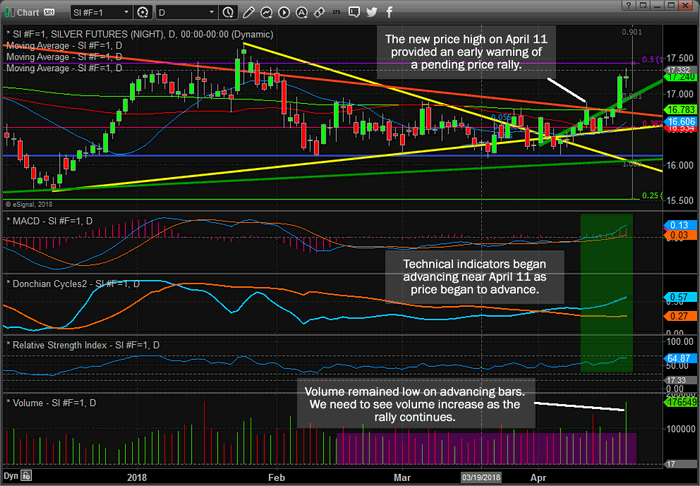 The $17.20 closing price on April 18th was technically a “confirmed price breakout” and established a new bullish trend in Silver. Right now, $17.45 is critical resistance and any closing price advance above this level will confirm an advance to near $18.35 (which will likely be very quick). $18.35 is the current upper resistance zone that price MUST breach in order to advance higher. 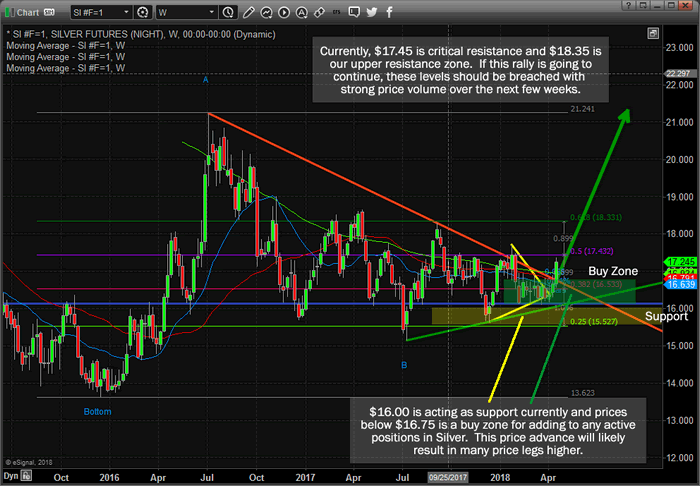 If you want to know what we are telling our members about this silver trade, then please consider joining Wealth Building Newsletter for more detailed Daily videos and analysis. You won’t want to miss this move in the metals, folks. We’ve been calling ETF trades for months with incredible accuracy. We know most of you who follow our analysis know we’ve been calling these markets almost perfectly since well before the start of 2018. Visit our website to read more of our recent research reports and to learn how we can assist you in staying well ahead of these market moves. Our most recent trade for our members pulled +17.7% in just a few days. We can’t stress the importance of having quality research partners to assist you in knowing what to expect in the markets and having a team of traders to assist you in finding great trades. We can help you find greater success and stay our of trouble in the markets. BECOME A TECHNICAL TRADER AND PROFIT FROM OUR TRADE ALERTS!